There’s something to be said for the coati. It’s not every day that we can learn so very much about ourselves when we go to the zoo and stare into an exhibit of obscure animals. My first introduction to this magnificent mammal happened a few years ago while visiting our favorite little zoo. An enclosure full of these critters that look like a raccoon that stuck its nose into a vacuum hose completely fascinated me. The first thing I learned that day was that “coati” is not pronounced “coat-ee” but instead “co-AH-tee,” not because the sign clarified that, but because my daughter, then age 5, corrected me and told me I should watch more animal TV shows so I can learn as much as she does. Beyond that embarrassment, I discovered that coatis are pretty smart animals. They have, I’m assuming, over many generations, learned how to get things done and thrive as a species. They have figured out how to best increase their populations and grow in strength and numbers. They have determined how to feed and raise their young and all the while live in a happy-go-lucky (or as happy-go-lucky a coati can be) social setting. They kicked out the guys. 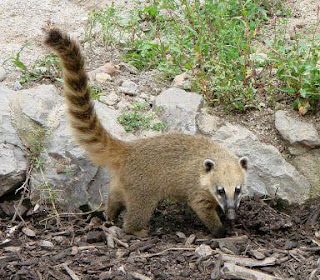 Coatis live in groups consisting of only females and immature males. Once the boys hit coati puberty, they leave the group until mating season and live a solitary life like the other older men, who I’d bet sit around and watch coati football games and work on coati cars. Female coatis take excellent care of each other and each other’s young, babysitting and even sometimes nursing each other’s babies. They are chatty animals, and spend a lot of time grooming themselves and each other. And if I was a betting woman, I’d also guess that they get a heap of stuff done and have a great time. I’m sure there’s the occasional coati bickering session and most likely little fights over the latest kill or fruit, but all in all, I think we can learn from these girls who really know how to band together and get the job done. I say this with such certainty only because I recently spent my very own weekend with all women. It was my annual trip to the Becoming an Ohio Outdoorswoman event hosted by the Ohio Department of Natural Resources. Besides a few instructors and a couple of cafeteria workers, it was all girls girls girls. And boy oh boy, did we have a great time. This event, held annually, provides women the opportunity to step into a so-called man’s world for a few days and try their hands at everything from candle making to muzzleloading. I personally spent my weekend laughing, dancing, and gabbing, not to mention kayaking, shooting trap, and learning to hunt ducks and geese. I also spent a windy Saturday afternoon climbing a 50-foot wooden structure. Let me rephrase that. I monkeyed myself up a 50-foot tower, contorting myself into positions that I haven’t seen since I had to buckle an infant into the back middle seat of an SUV. Only instead of being hunched over in a car, I was dangling 40 feet off the ground, totally relying on the woman holding my safety belay rope and the cheers of the other women watching. If it weren’t for the cheers, I would have never made it to the top. If it weren’t for the applause while sitting on the top of the tower, I would have frozen up there. And if it weren’t for the high fives and hugs, I would have never climbed it again. There’s just something empowering about getting a big group of women together. Almost as instinctively as our dear friend the coati, something deep inside of us knows to take care of each other, to help each other and how to sweeten our days. Women know our strength in numbers, yet to the onlooker it might seem puzzling and almost enigmatic. Unless, of course, the onlooker is a coati, in which case she might just join in. Check out the Becoming an Ohio Outdoorswoman here! Cute comparison! Thanks for great comments. See you next year!